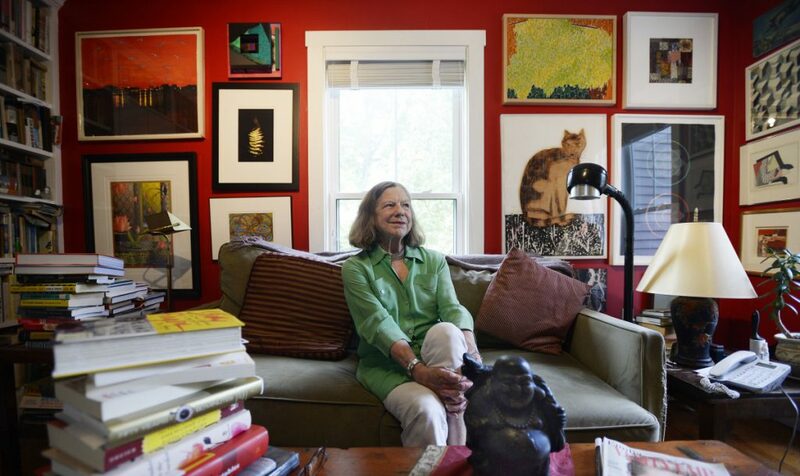 The Maine art community will honors her with a reception at the gallery off Stevens Avenue in Portland on Thursday. Anne Zill loved her job as gallery director at the University of New England in Portland. For 20 years, she worked with artists and educators and planned art exhibitions that reflected our times and our place in the world. As satisfied as she was with her work, Zill is happier with her retirement. She concluded her duties at the Art Gallery at UNE – “the cube” as it’s affectionately known – earlier this month and now can put to paper the memoir about her life that she has been writing in her mind for so many years. On Thursday, the Maine art community honors Zill, 76, with a reception at the gallery off Stevens Avenue. Her retirement party begins at 5 p.m.
Zill’s curatorial tenure was marked by a commitment to Maine artists and in particular to women artists, which she achieved by planning exhibitions that promoted and celebrated women’s accomplishments and causes. During Zill’s tenure, the gallery also established a reputation as one of Maine’s top destinations for fine-art photography. Prior to coming to work at the gallery in 1998, Zill spent much of her adult life in Washington, D.C., working with lawmakers, philanthropists and nonprofit foundations to improve the lives of women, minorities and oppressed people. Among the colleagues she learned from were the philanthropist Stewart R. Mott; “battling Bella” Abzug, the fiery progressive U.S. representative from New York; and the activists Betty Friedan and Gloria Steinem. “Bella I knew the best, but I knew them all,” Zill said. Once at UNE, she used her connections in politics and world affairs to continue her work on a global scale. In 2001, she collaborated with U.N. Secretary-General Kofi Annan on a women’s exhibition at the United Nations in New York. A decade later, she went to Paris to curate an exhibition of photography by American women artists that celebrated Women’s History Month. To replace Zill, UNE hired Amanda Skinner as interim gallery manager. Skinner graduated in 2013 from the University of Maine with a bachelor’s degree in art history, and in 2016 from Tufts University with a dual master’s in art history and museum studies. Prior to joining UNE, she worked and interned at the University of Maine Museum of Art and the Portland Museum of Art. Elizabeth Moss, who operates an art gallery in Falmouth, views Zill as a role model for her specifically and for women in the arts in general. Moss met Zill in the 1990s, when Moss approached her about advertising in the Maine Gallery Guide. Moss was swayed by what she called Zill’s “sharp wit, inviting nature and sparkling eyes.” Zill supported the efforts of Moss to open a gallery “by discreetly putting in a good word about me to her influential friends” and, more publicly, by co-founding the Maine Museum of Photographic Arts with Moss. Zill certainly didn’t do it alone, and that is something she emphasizes whenever she talks about her work at the gallery over time. She credits people like Stephen K. Halpert for his effort to build the gallery’s collection of photography with images by Berenice Abbott, Todd Webb, Verner Reed, Henri Cartier-Bresson and Eugene Atget, and for her predecessor, Gael McKibben, for establishing the gallery’s high standards – and the university for supporting the gallery in general. Andres Verzosa, a former Portland gallery owner who now lives in Connecticut, said Zill always had the interests of the larger Portland art community in mind. She invited Verzosa to curate several shows at the gallery, including an exhibition marking the first anniversary of Sept. 11 and a four-part series about Maine women pioneers. Coming to Maine meant coming home. Zill was born in Philadelphia and moved to Maine when she was 7. She grew up in South Freeport and left the state for Barnard College in New York City, graduating in 1963. She married young, moved to Washington, D.C., and later earned her master’s in journalism from American University. She worked for political activist Ralph Nader, with whom she honed her skills as a reformer. She also worked as news director and a producer with the National Educational Radio Network, the predecessor of National Public Radio in the 1960s and early 1970s, and after Watergate began working to elect more women to political office. She co-founded the Women’s Campaign Fund and founded the Women’s Campaign Research Fund. At the Stewart R. Mott Charitable Trust, she helped the foundation achieve its goals in issues of government reform, arms control, population growth and civil rights. She also worked briefly for the Ford Foundation. She’s moved back to Maine several times – in the summer of 1978, then for a sabbatical a decade later and, finally, for good in 1996. Her advice to anyone who wants to make a difference in the world is to never stop asking questions, never turn down the chance to meet someone new and always surround yourself with thoughtful people who challenge you.